The TOGAF Architecture Development Method (ADM) provides a process lifecycle to create and manage architectures within an enterprise. At each phase within the ADM, a discussion of inputs, outputs, and steps describes a number of architectural work products or artifacts, such as process and application. 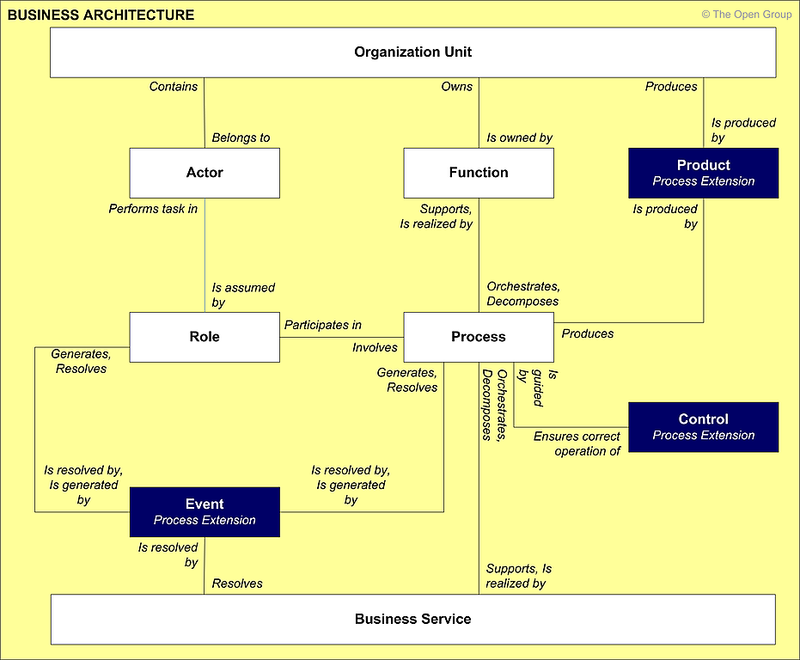 The content metamodel provided here defines a formal structure for these terms to ensure consistency within the ADM and also to provide guidance for organizations that wish to implement their architecture within an architecture tool. 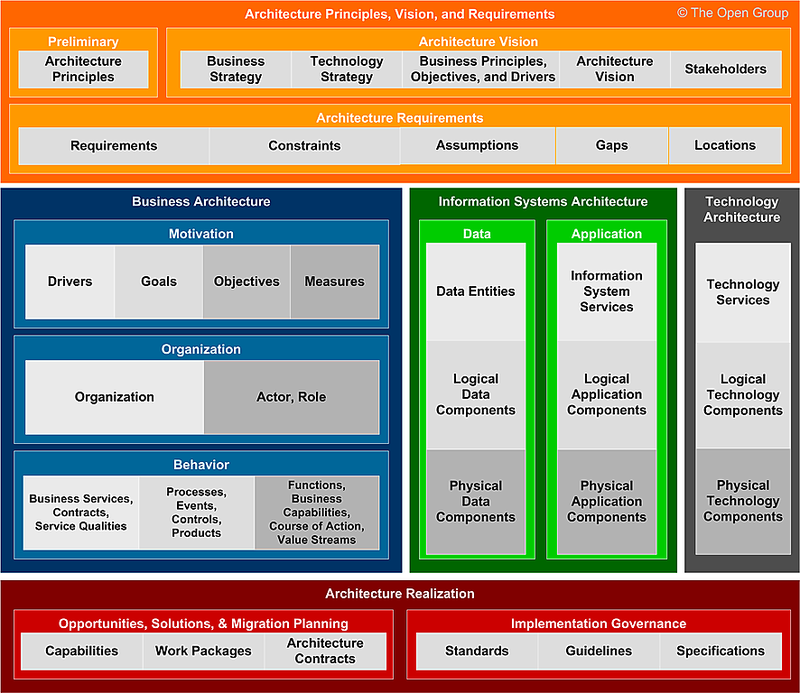 A TOGAF architecture is based on defining a number of architectural building blocks within architecture catalogs, specifying the relationships between those building blocks in architecture matrices, and then presenting communication diagrams that show in a precise and concise way what the architecture is. The role of the TOGAF framework is to provide an open standard for architecture that is applicable in many scenarios and situations. In order to meet this vision, it is necessary to provide a fully featured Enterprise Architecture metamodel for content and also to provide the ability to avoid carrying out unnecessary activities by supporting tailoring. The metamodel must provide a basic model with the minimum feature set and then support the inclusion of optional extensions during engagement tailoring. 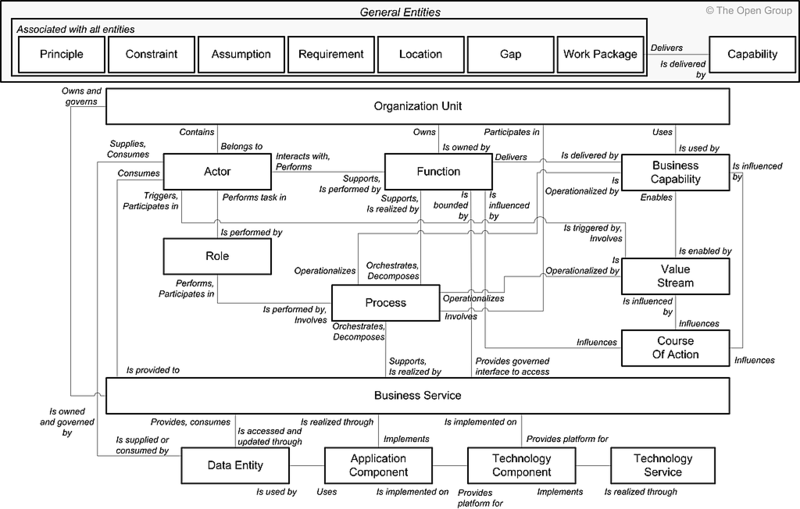 The core TOGAF content metamodel and its extensions are illustrated in Figure 30-1 . The core metamodel provides a minimum set of architectural content to support traceability across artifacts. Additional metamodel concepts to support more specific or more in-depth modeling are contained within a group of extensions that logically cluster extension catalogs, matrices, and diagrams, allowing focus in areas of specific interest and focus. All extension modules are optional and should be selected during the Preliminary Phase of the architecture development to meet the needs of the organization. Additionally, the extension groupings described by the content metamodel are only a suggestion and further tailoring may be carried out to suit the specific needs at the discretion of the architects. Data entities can be tied to applications, repositories, and services and may be structured according to implementation considerations. An information system service may deliver or support part or all of one or more business services. Organization units may include external parties and business partner organizations. A more in-depth definition of terms used within the content metamodel can be found in Part I, 3. Definitions . A process is a flow of interactions between functions and services and cannot be physically deployed. All processes should describe the flow of execution for a function and therefore the deployment of a process is through the function it supports; i.e., an application implements a function that has a process, not an application implements a process. The term "function" is used to describe a unit of business capability at all levels of granularity, encapsulating terms such as value chain, process area, capability, business function, etc. Any bounded unit of business function should be described as a function. A business service operates as a boundary for one or more functions. The granularity of business services is dependent on the focus and emphasis of the business (as reflected by its drivers, goals, and objectives). 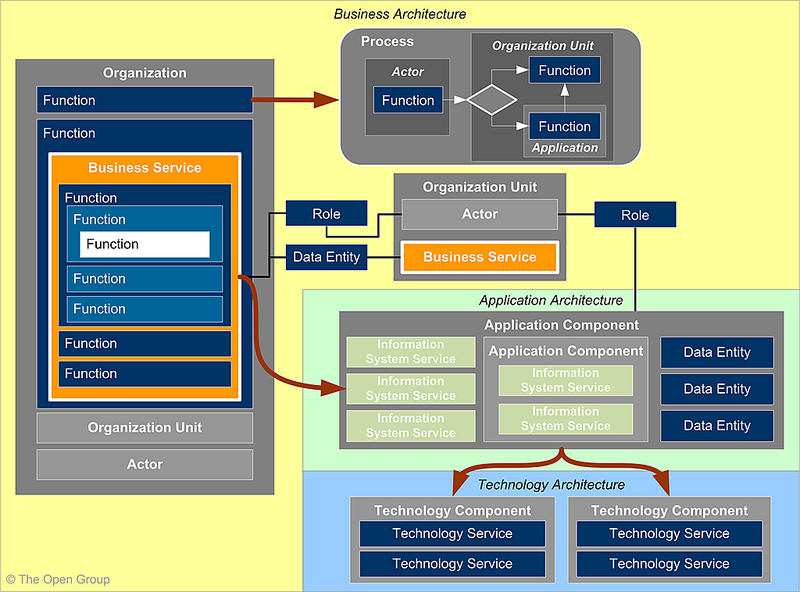 A service in Service-Oriented Architecture (SOA) terminology (i.e., a deployable unit of application functionality) is actually much closer to an application service, application component, or technology component, which may implement or support a business service. Business services may be realized by business activity that does not relate to IT, or may be realized through IT. Business services that are realized through IT are implemented onto application components. 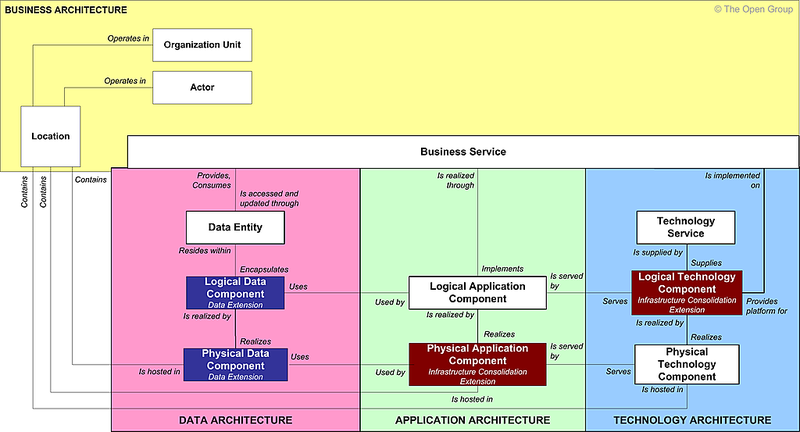 Application components can be hierarchically decomposed and may support one or more business services. It is possible for a business service to be supported by multiple application components, but this is problematic from a governance standpoint and is symptomatic of business services that are too coarse-grained, or application components that are too fine-grained. 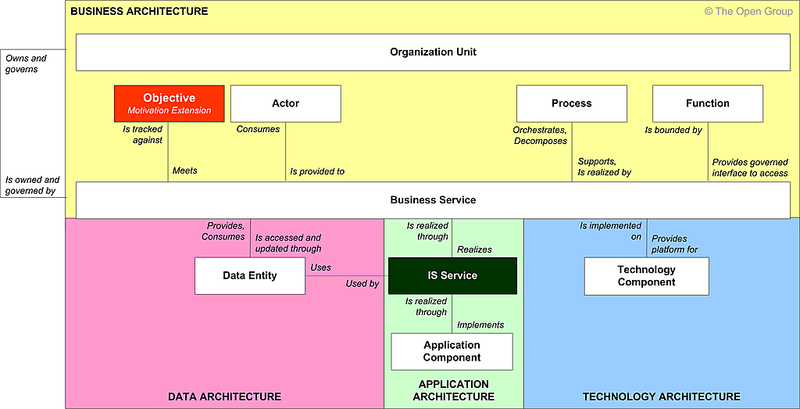 An application component is implemented by a suite of technology components. For example, an application such as "HR System" would typically be implemented on several technology components, including hardware, application server software, and application services. Figure 30-2 illustrates the core entities and their relationships. The content metamodel defines a set of entities that allow architectural concepts to be captured, stored, filtered, queried, and represented in a way that supports consistency, completeness, and traceability. At the highest level, the content framework is divided up in line with the TOGAF ADM phases, as shown in Figure 30-3 . The architecture context is typically collected in the Preliminary and Architecture Vision phases. A more detailed representation of the content metamodel is shown in Figure 30-4 . Figure 30-5 shows the metamodel entities and relationships that are present within the core content metamodel. When all extensions are applied to the core content metamodel, a number of additional metamodel entities are introduced. Figure 30-6 shows which entities are contained in the core content metamodel and which entities are introduced by which extension. The relationships between entities in the full metamodel are shown in Figure 30-7 . As discussed earlier, the TOGAF content metamodel supports a number of extension modules that allow more in-depth consideration for particular architecture concerns. Figure 30-8 shows the core content metamodel and predefined extension modules. During the Architecture Vision phase of a particular engagement, the scope of the engagement will be used to make a determination on appropriate extensions to be employed in order to adequately address the architecture requirements. For example, the scope of an engagement could be defined as core content, plus the governance extensions, as shown in Figure 30-9 . The following sections provide a more detailed description of the purpose and content of each of the extension modules. The governance extension is intended to allow additional structured data to be held against objectives and business services, supporting operational governance of the landscape. Extensions to the core metamodel entities and relationships are shown in Figure 30-10 . The services extension is intended to allow more sophisticated modeling of the service portfolio by creating a concept of Information System (IS) services in addition to the core concept of business services. IS services are directly supported by applications and creating the layer of abstraction relaxes the constraints on business services while simultaneously allowing technical stakeholders to put more formality into an IS service catalog. Extensions to the core metamodel entities and relationships are shown in Figure 30-11 . The process modeling extension is intended to allow detailed modeling of process flows by adding events, products, and controls to the metamodel. Typically, Enterprise Architecture does not drill into process flow, but in certain process-centric or event-centric organizations it may be necessary to elaborate process in a much more formal manner using this extension module. Extensions to the core metamodel entities and relationships are shown in Figure 30-12 . The data extension is intended to allow more sophisticated modeling and the encapsulation of data. 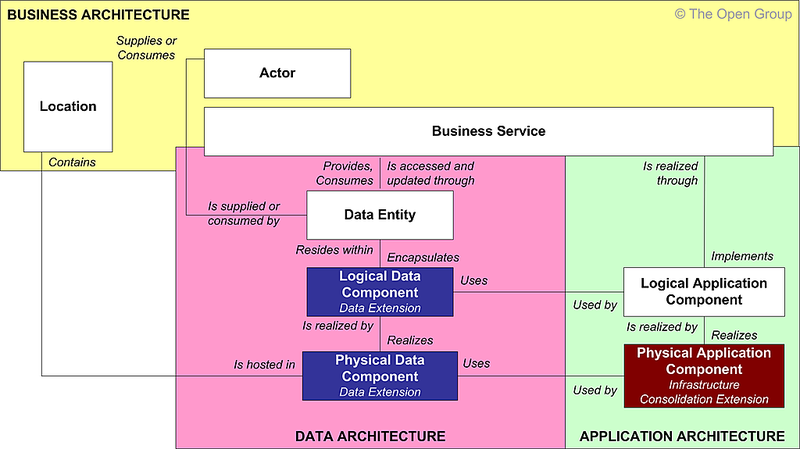 The core model provides a data entity concept which supports the creation of data models, which is then extended by this extension to include the concept of a data component. Data components form a logical or physical encapsulation of abstract data entities into units that can be governed and deployed into applications. Extensions to the core metamodel entities and relationships are shown in Figure 30-13 . The infrastructure consolidation extension is intended to be used in landscapes where the application and technology portfolios have become fragmented and the architecture seeks to consolidate the business as usual capability into a smaller number of locations, applications, or technology components. Extensions to the core metamodel entities and relationships are shown in Figure 30-14 . The motivation extension is intended to allow additional structured modeling of the drivers, goals, and objectives that influence an organization to provide business services to its customers. This in turn allows more effective definition of service contracts and better measurement of business performance. Extensions to the core metamodel entities and relationships are shown in Figure 30-15 . The following table lists and describes the entities within the content metamodel. An encapsulation of application functionality aligned to implementation structure. For example, a purchase request processing application. See also Logical Application Component and Physical Application Component. A statement of probable fact that has not been fully validated at this stage, due to external constraints. For example, it may be assumed that an existing application will support a certain set of functional requirements, although those requirements may not yet have been individually validated. A particular ability that a business may possess or exchange to achieve a particular purpose. A business-focused outcome that is delivered by the completion of one or more work packages. Using a capability-based planning approach, change activities can be sequenced and grouped in order to provide continuous and incremental business value. A decision-making step with accompanying decision logic used to determine execution approach for a process or to ensure that a process complies with governance criteria. For example, a sign-off control on the purchase request processing process that checks whether the total value of the request is within the sign-off limits of the requester, or whether it needs escalating to higher authority. Direction and focus provided by strategic goals and objectives, often to deliver the value proposition characterized in the business model. An encapsulation of data that is recognized by a business domain expert as a thing. Logical data entities can be tied to applications, repositories, and services and may be structured according to implementation considerations. An external or internal condition that motivates the organization to define its goals. An example of an external driver is a change in regulation or compliance rules which, for example, require changes to the way an organization operates; i.e., Sarbanes-Oxley in the US. An organizational state change that triggers processing events; may originate from inside or outside the organization and may be resolved inside or outside the organization. Delivers business capabilities closely aligned to an organization, but not necessarily explicitly governed by the organization. Also referred to as "business function". Gap analysis is described in Part III, 23. Gap Analysis . The automated elements of a business service. An information system service may deliver or support part or all of one or more business services. A place where business activity takes place and can be hierarchically decomposed. An encapsulation of technology infrastructure that is independent of a particular product. A class of technology product; for example, supply chain management software as part of an Enterprise Resource Planning (ERP) suite, or a Commercial Off-The-Shelf (COTS) purchase request processing enterprise service. An indicator or factor that can be tracked, usually on an ongoing basis, to determine success or alignment with objectives and goals. A time-bounded milestone for an organization used to demonstrate progress towards a goal; for example, "Increase capacity utilization by 30% by the end of 2019 to support the planned increase in market share". A self-contained unit of resources with goals, objectives, and measures. Organization units may include external parties and business partner organizations. A specific technology infrastructure product or technology infrastructure product instance. For example, a particular product version of a Commercial Off-The-Shelf (COTS) solution, or a specific brand and version of server. A sample set of Architecture Principles is defined in Part III, 20. Architecture Principles . Processes represent a sequence of activities that together achieve a specified outcome, can be decomposed into sub-processes, and can show operation of a function or service (at next level of detail). Processes may also be used to link or compose organizations, functions, services, and processes. Output generated by the business. The business product of the execution of a process. A quantitative statement of business need that must be met by a particular architecture or work package. An element of behavior that provides specific functionality in response to requests from actors or other services. 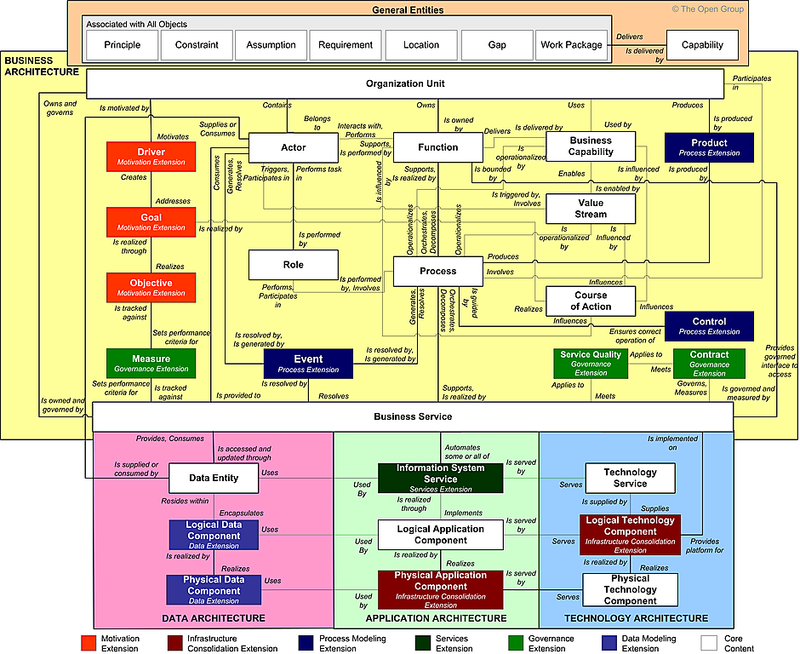 A service delivers or supports business capabilities, has an explicitly defined interface, and is explicitly governed. Services are defined for business, information systems, and platforms. A preset configuration of non-functional attributes that may be assigned to a service or service contract. An encapsulation of technology infrastructure that represents a class of technology product or specific technology product. A representation of an end-to-end collection of value-adding activities that create an overall result for a customer, stakeholder, or end-user. The following table shows typical attributes for each of the metamodel entities described previously. Unique identifier for the architecture entity. Brief name of the architecture entity. Textual description of the architecture entity. User-definable categorization taxonomy for each metamodel entity. Location from where the information was collected. Owner of the architecture entity. Describes how this capability provides value to the enterprise. Lists possible maturity/quality levels for the capability. This metamodel entity has only basic attributes. The following categories of Location apply: Region (applies to a grouping of countries or territory; e.g., South East Asia, UK, and Ireland), Country (applies to a single country; e.g., US), Building (applies to a site of operation; where several offices are collected in a single city, this category may represent a city), and Specific Location (applies to any specific location within a building, such as a server room). The nature of the business may introduce other Locations: Ship or Port for a ferry company, Mine for a gold company, Car for a police force, Hotel for any firm's traveling workers, and so on. The following categories of principle apply: Guiding Principle, Business Principle, Data Principle, Application Principle, Integration Principle, Technology Principle. Priority of this principle relative to other principles. Statement of what the principle is. Statement of why the principle is required and the outcome to be reached. Statement of what the principle means in practical terms. Identifies mechanisms that will be used to measure whether the principle has been met or not. Statement of what the requirement is, including a definition of whether the requirement shall be met, should be met, or may be met. Statement of why the requirement exists. Statement of what tests will be carried out to ensure that the requirement will be met. Estimated number of FTEs that operate as this Actor. Objectives that this actor has, in general terms. Tasks that this actor performs, in general terms. Non-Standard, Proposed Standard, Provisional Standard, Standard, Phasing-Out Standard, Retired Standard. If the product is a standard, when the standard was created. Last date that the standard was reviewed. Next date for the standard to be reviewed. Date when the standard was/will be retired. Functional behavior to be supported within the scope of the contract. Non-functional behavior to be supported within the scope of the contract. Degree to which something is available for use. Hours during which the service must be available. Ability to gather information about the state of something and control it. Ability to identify problems and take corrective action, such as to repair or upgrade a component in a running system. Ability of a component to perform its tasks in an appropriate time. Response times that the service provider must meet for particular operations. Contracted requirements on accuracy and completeness of information. 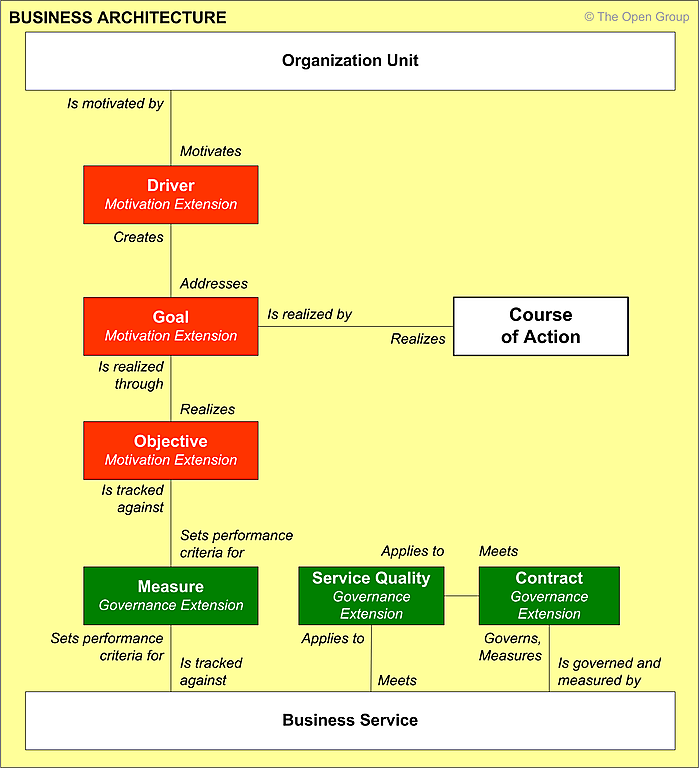 Level of governance and enforcement applied to the contractual parameters for overall service. Measures in place to ensure that each service request meets contracted criteria. Ability to restore a system to a working state after an interruption. Ability of a system to be found when needed. Ability of a system to prevent unauthorized access to functions and data. Protection of data from unauthorized access. Ability of a system to ensure that data has not been corrupted. Ability of a system to ensure that the service request originates from an authorized source. Ability of a service to support localized variants for different consumer groups. Ability of a service to support international variations in business logic and data representation (such as character set). Ability of the service to interoperate with different technical environments, inside and outside of the organization. Ability of the service to grow or shrink its performance or capacity appropriately to the demands of the environment in which it operates. Of data, people, applications, and components. Ability to accept new functionality. Contracted capacity of the service provider to meet requests. Time period needed to deliver throughput capacity. Expected future growth rate of service request. Time period needed to reach the expected growth rate. Short-term profile of peak service traffic. Long-term profile of peak service traffic. Number of FTEs working within the organization. Criticality of this process to business operations. Whether this process is supported by IT or is a manual process. Data on frequency of process execution. Proposed, In Development, Live, Phasing Out, Retired. Date when the first release of the application was/will be released into production. Date when the last release of the application was released into production. Date when the next release of the application will be released into production. Date when the application was/will be retired. Hours during which the application must be available. The following categories of data entity apply: Message, Internally Stored Entity. Level of restriction placed on access to the data. Level of retention to be placed on the data. Logical Technology Components are categorized according to the defined taxonomy (such as the TOGAF TRM), adapted to meet the needs of an individual organization. 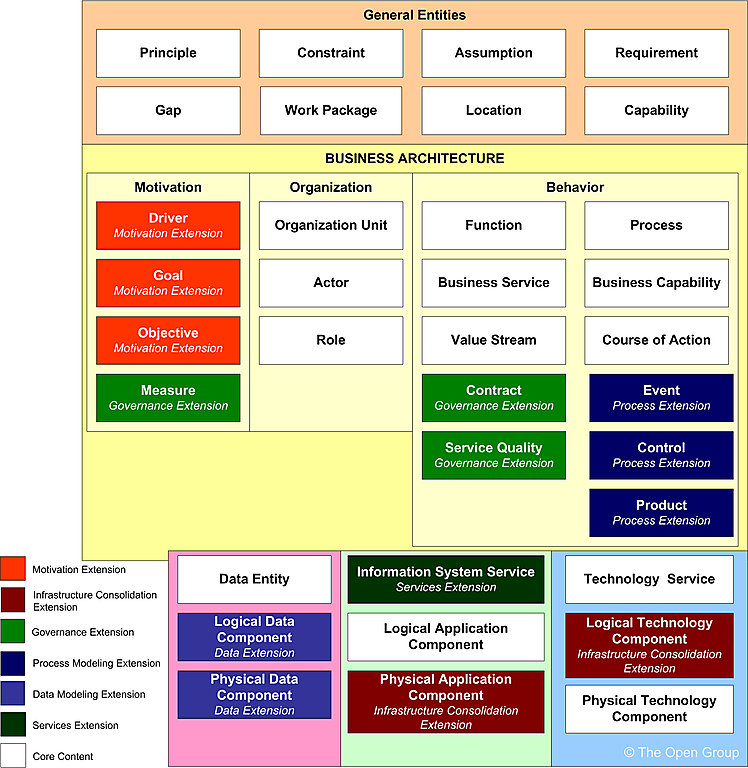 Physical Technology Components are categorized according to the defined taxonomy (such as the TOGAF TRM), adapted to meet the needs of an individual organization. Name of the product making up the technology component. Module, or other sub-product, name making up the technology component. Vendor providing the technology component. Version of the product making up the technology component. Technology Services are categorized according to the defined taxonomy (such as the TOGAF TRM), adapted to meet the needs of an individual organization. The following categories of work package apply: Work Package, Work Stream, Project, Program, Portfolio. Describes the contribution this work package makes to capability delivery.